Sorry Messieurs Tuttle, Gardner, Cunningham, and Watkins, but I think Nuk is the most polished receiver to ever play at Clemson. Was not overly impressed with running game. Stats ended up looking nice, but thought Ellington would be able to break off a couple of nice runs. Had one late to seal the game, but figured he may be able to do that a few times throughout the game. Still undecided on decision to go for 4th and inches in 4th quarter. On one hand, like the confidence in the offense to be able to pick up the yardage and the confidence in the defense that they can take care of themselves. But unsure if that was right call. Too much risk for minimal reward. Throw everything from BC out the window. Georgia Tech is the exact opposite. Did not like the fake field goal decision. I know it was for naught because of the penalty, but felt like we should either kick the field goal (it was inside 50) or go for it with 1st team offense. Percentage of picking up 5 yards w/ Boyd and company has to be higher than special teams with Stoudt. Catanzaro continues to impress. He can play on Sundays. Controlled Chaos is my new nickname for offense. It looks disjointed and confusing, but works. Really well. Check in later this week as we review the BC game, prep for GT, and get ready for Mullet Fest 2012 in Columbia. Clemson follows up their heartbreak against FSU with a trip to a place they haven’t fared well over the years. In their last six trips to Bahstan, Clemson has just one win. But most of those games were against good, if not great BC teams. Teams averaging 8-9 wins per season with great offensive lines, solid quarterbacks, and active linebackers. On this BC team, only the linebackers are recognizable (don’t give me the Rettig is a great qb line). In its place is a team leading the ACC in passing, but mostly because they can’t run the ball. So how does Clemson match up against this type of BC team? It couldn’t be worse, so it has to be better. For the first time this year, Clemson can play the pass first. That will allow them to pursue the quarterback, disguise coverages, and bring pressure from multiple locations. And it means Clemson’s defense will have its best Saturday in a while. And defensive success means more opportunities for Clemson’s offense. While I don’t expect it to keep the same pace, or even have the same success, as they did against FSU, they will score. Look for Clemson to have a similar gameplan as they did for Auburn. They should have success running the ball and finding receivers in the flats. Look for multiple plays and long drives. And in the end, the BC defense wears down. Which leads me to Saturday’s ACC “masterpiece of the week” in Chestnut Hills. Speed Racer Dabo knows he has to make Boston College feel like a bunch of Pickens Policemen to make folks forget Tallahassee. So expect a romp of epic proportions. To be fair, BC does have a win over Maine which probably makes them one of the top tier ACC teams. But forget it Eagles, you are in the wrong place at the wrong time. Clemson is angry and embarrassed and dying to get last week in rear view mirror. I bet even all of their receivers “avoid the munchies” this week to make sure they are fully sharp and ready to go. Tiggers will roll and get most of the kool-aid spigots gushing again! The UCS athletic department keeps setting them up and the UCS football keeps knocking them down. One after another top-level opponents stand before UCS and one after another they get sent home. This week is no different as UCS travels to perennial SEC power Kentucky. Don't let Kentucky’s less than pristine record fool you. Don't be swindled by their blow-out loss to Florida or crushing home defeat to Western Kentucky. Don’t focus on how they won five games last year (seriously – how did they win five games last year) or how you beat them like a drum. Don’t get sucked into feeling sorry for Joker Phillips. UCS should have no trouble establishing a rhythm on offense to establish an early lead. Once they get that lead, Kentucky will be forced to abandon their terrible run game in search of points in the passing game. The UCS defensive line will then take over and strangle Kentucky, forcing them into mistakes and turnovers. A two touchdown game turns into a second half romp for the fightin’ Spurriors as they give the starters most of the second half to rest for UGA. All that said, UCS needs to remember one thing: Don’t get caught peeking at Mrs. Judd, at least not in the first half. If you do, this game could go the way of your last trip to Lexington. Good thing for you this Kentucky team is more like the Mrs. Judd from Dolphin Tale rather than the Mrs. Judd from Double Jeopardy. And the second half will give you all the time you need to locate Mrs. Judd and try to coax a smile. As a long time Gamecock fan, this game is just the type of game that I used to circle as an upset and I will admit I still don’t like games like this on the road for us when our opponent has supposedly been left for dead. Old Joker-P may be coaching for his job the rest of the way and if you’re being rational, you have to admit that we could be peeking a bit ahead to Jawja next week. Are we the better team? Of course. Should we win comfortably? Absolutely. Does any of that mean we will cruise for sure. Not a chance. Give me a win herewith no major injuries and I honestly don’t care how it looks, what the score is or any of that. The goal here is to have the clock run out and us be ahead and on the plane coming home at 5-0. I think we will after some “tightening of the hineys” for a chunk of the contest. Note: As of 09/28/12, the formula was revised to better handle losses. Points will now be deducted based upon the strength of the opponent, with fewer points being lost for better opponents. FSU's win over Clemson places them squarely in the MNC (Mythical National Championship) picture, along with traditional powers Alabama & LSU and upstarts Oregon and West Virginia. And no sooner did the lights go out in Doak Campbell Stadium did pundits across the southeast try to compare this FSU team to the SEC. To the pundits credit, in a sport with no formal playoff, this is a legitimate question. But in asking the question, the wording is quite wrong. Instead of asking whether FSU can win the MNC, the question is whether FSU can compete with the SEC. And because it's asked this way, it leads you to believe the entire SEC is at one level and everyone else a rung below. Most cry semantics, but it's not. These teams are not interchangeable, meaning because you lose to one you will automatically lose to the others. And vice versa, just because beat one does not mean you can beat them all. It reeks of the idea that the entire SEC is greater than any other team, and that's simply not the case. Should FSU win the ACC, do they render the ACC complete and move on to the next level, the SEC, like some video game? Is the ACC Level 1 and the SEC Level 2? The problem is this isn't a video game, or even European Soccer, it's college football, where the two best teams get one chance to play one game for one MNC. So the question isn't whether FSU can compete with the SEC. The question is whether FSU can compete with Alabama or LSU or any other top tier team. In order to determine if they're ready for the challenge, we've created a point system to determine how good each team is. Points are earned based upon a team's competition and how they've performed against said competition. Also, to account for the performance against an opponent, whether or not a team covered the spread is considered, with an increasing value equal depending on the opponent. Once again, you cover the spread, you get the points. You don't cover the spread, you lose the points. For example, FSU's win over Wake Forest is worth 12 points (for now, will change as the season progresses): +8 for a win over a FBS team in the top +4 of their BCS conference and 4 more since they covered the spread. On the other hand, Wake's loss to FSU is worth -6: -2 for the loss and -4 for the spread. Conversely, FSU's win over Clemson is worth 4 points; +8 for the win and -4 for not covering the spread, while Clemson's loss is worth +2: -2 for the loss and +4 for the spread. Below is a breakdown of each school in the SEC and ACC and their point totals, along with average points per team. Teams are sorted by their total points. Looking at the results, the SEC definitely has an edge at the top as the top 4 teams all come from the SEC. It shows FSU would be fifth in the SEC, if all ended now. But because of the small sample size, FSU is a late Clemson touchdown from being at 29 and tied for first with Florida. As the sample size increases, we should see a better representation of each team and their potential. We'll continue to monitor the results to see how the teams stack up against each other. All things considered, based upon current opponents, I think the argument can be made that FSU is not on par with the upper tier of the SEC. Also, it should be noted how weak the bottom of the SEC is. The bottom two, and four of the bottom six, all come from the SEC. You can argue for the SEC being much stronger at the top, but you can't argue they are stronger top to bottom. Both conferences have pitiful teams bringing up the lower third. Please check back next week as we see how the standings shift with another round of games. Though Clemson only totaled 136 yards on the ground, the run game was effective and it kept the defense honest. Ellington did well on the stretch plays, turning the corner on multiple runs and Watkins was tough up the middle. If anything, I think Clemson got away from the run in the third quarter when they went five straight possessions without a first down. During those five possessions, neither Ellington nor Watkins got any carries and it allowed FSU’s defense to focus on Boyd as the primary ball carrier. In addition, the run would have allowed the defense time to rest and regroup, though not sure how much it would have mattered. The purpose of making FSU to drive the ball was to eventually force them into mistakes and keep them off the scoreboard. In the first half, this proved to be fairly successful as FSU’s three longest possessions resulted in no points (two missed FG and a punt). Unfortunately, in the second half, Clemson was unable to sustain the same success as FSU added five touchdowns, with the turning point being when FSU scored two touchdowns in five plays to cut the lead to 3. Also, the Clemson defense gave up huge plays in both the passing and rushing game. All totaled, I count nine FSU plays of greater than 20 yards, including two touchdowns. Ultimately, the Clemson defense wore down and FSU was able to impose their will. And with every play, the inevitable became more and more of reality. In building their 14 point lead, Clemson faced only three 3rd and longs, two of which they were able to convert. In the following seven possessions, Clemson was 2 for 6. Staying out of 3rd and longs is critical to this offense, and the disparity between the two halves bears this out. Against any defense, converting 44% of 3rd and longs is outstanding. But against this defense, it’s downright amazing. And in the first half to limit yourselves to only three 3rd and longs is quite an achievement. Even though Clemson struggled for a bit in the second half, their overall performance was impressive. Clemson started only 1 (one) drive in FSU territory (the muffed punt). The result of that one possession - touchdown. Every other Clemson drive started from inside their 35. Needing 35-40 yards for to get into field goal range and 65-70 yards for a touchdown is much to ask for any offense. To ask it against this FSU makes it even tougher. But to Clemson’s credit, they had four touchdown drives of 65 yards or longer. But even with that success, you’re left with this taste in your mouth as to how well this offense could perform if it had a short field to work with. Considering Clemson has turned every possession started in opposing territory into a touchdown, 1 or 2 more opportunities could have made a major difference in the final score. Clemson did exactly what it needed to do. They scored touchdowns on their first two possessions and three of their first four. Included in that span were the bomb to Hopkins, a fake field goal, new offensive wrinkles, and an FSU fumble. The Doak crowd was quieted and the Clemson faithful were rockin’. Unfortunately, it didn’t matter in the end, but without this start, Clemson could have been run out of the building 1990’s style. Clemson did everything it needed to do to win this game – except finish. The offense stalled, the defense sucked, and the special teams were quite “special”. And while a win over FSU in primetime would have been amazing, losing doesn’t change the projection of this season. We knew the road to Charlotte would go through Tallahassee and the advantage would be FSU’s. And losing to FSU on the road is nothing to be ashamed of or embarrassed about. But, while you shouldn’t be ashamed, there is little room for morale victories. Should you be pleased with how the defense played? No – you should expect better. Should you be happy to have competed with FSU on the big stage? No – you should expect to be in these games, and to win them. I’m certainly not happy, but I’m not distraught either. We knew this team would hit some bumps, and we knew FSU was the most likely place for such bumps. But if Clemson is not going to allow this loss to derail their season, I won’t let it dampen mine. My support is still strong – and so should yours. Also, no word from the ACC Commissioner's office on whether Ron Cherry will be allowed to referee any of "Samurai's" games. Kickoff units were terrible. Not sure if Clemson was short kicking on purpose, but it hurt the field position battle much more than it helped. Even when Clemson tackled the returner, the feeling that FSU was close to popping one abounded. Check back often this week as we’ll spend a few columns breaking down the game and seeing how this plays out going forward. Hours and pages have been spent breaking down the winning keys for both Florida State and Clemson; determining what each needs to do to secure a win and get a leg up in the ACC Atlantic Division. Clemson comes out just as fired up as FSU and has early success on both offense and defense. The offense notches a field goal on their first drive and a touchdown on their second, while the Clemson defense implements the bend but don't break method to keep FSU off the board. The result is an early 10-0 lead for the Tigers. Unfortunately, FSU settles down and their offense begins to find a rhythm. They reach the end zone on back to back possessions (with a Clemson FG sandwiched between) to take their first lead at 14-13. The teams go back and forth the rest of the half, but Clemson finds pay dirt to FSU's field goal as Clemson heads to the locker room up 20-17. The second half slows down as both teams struggle to find offensive success. The game turns into a field position battle until FSU mounts a drive into Clemson territory, but is forced to settle for a field goal to tie it at 20. The score remains tied until early in the 4th when Clemson pushes the ball inside the FSU 10, but is forced to settle for a short field goal and a 23-20 lead. FSU responds with a long, methodical touchdown drive to take a 27-23 lead. The score stays 27-23 FSU until Clemson's last drive. They once again move the ball into FSU territory, but are unable to score a touchdown and turn the ball over on downs. FSU milks the clock with a first down and ends the game in victory formation. For Clemson fans, this game will feel eerily similar to the Auburn game of 2010 where Clemson plays hard, smashmouth football, but can't hold an early lead. There is disappointment in the loss, but heads are held high in the way this team played. The hope for 2012 is the team doesn't have a hangover week in Chestnut Hill like they did at home to Miami in 2010. At the conclusion of the Furman game, I thought there is no chance this Clemson team leaves Tallahassee with a win. The offensive line looked tentative, the defensive front seven looked soft, and the secondary looked lost. Then something happened, and everything changed: Vegas, the pundits, and the media fell hard for FSU. The spread opened at 12 in FSU's favor and quickly climbed to 13.5. Everyone wanted a piece of FSU. And no one had any respect for Clemson. And the more people fawned over FSU, the more it solidified Clemson. And the more I liked this Clemson team. Enough to cove the two touchdown spread? Yes. Enough to win outright on the road? No, unfortunately. But right now, one thing is keeping this Clemson team from greatness – its defense. Watching this Clemson defense takes me back to my Civil days at Clemson, with words like sieve, porosity, elasticity, and compaction. Hopefully the defense is just in its curing phase – and will come out solid and at full strength for FSU. I expect Clemson to play well in Tallahassee – even grabbing an early lead; however, the FSU defense makes enough stops to keep Clemson close. 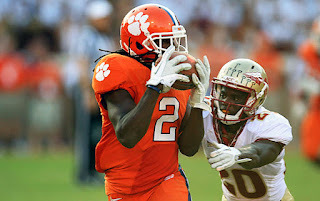 Eventually, the FSU run game erodes the Clemson defense, causing it to crumble. And FSU squeaks out a win. Clemson typically wins games like this where they are a heavy underdog, especially when they are playing a team that is viewed by the national media as “having bigger fish to fry.” I remember their upset of Miami a few years back as an example and several times beating the Noles in recent contests. So the first half of the equation to me is simple: Clemson will not lose by 14 points. Having said that, I have been pretty consistent that the lack of depth along both lines of scrimmage at some point is going to jump up and bite the Tigers this year. Clemson clearly has some nice skill position players and they have acted like completely insane fools to get the national media to “believe” in Dabo again. Clemson will play well, get every bounce and break in the book and fall just short on Saturday night. Missouri’s nickname of Tigers comes from the Civil War and a group of civilians who took up arms to defend the University from Confederates. In addition to history, Mizzou has a solid quarterback, which is something UCS hasn’t faced this year. They’ve seen flashes from Vandy, ECU, & UAB, but nothing quite like Mr. Franklin. But there’s one problem with Missouri – they’re uniforms. While they carry the flags of the union, SEC, and Tigers, they look like Vandy. And Vandy is not how you want to look. This one is a very tough call and for once it’s not because we don’t know what to expect from my Gamecocks. The tough read here is Mizzou. I have no doubt the Tigers will move the ball between the 30s and throw some early wrinkles in the mix and get some points. Carolina’s defense will get better as the night goes along as it usually does and I think our overall depth will carry the day. USC’s offensive line has been hearing what a disappointment it is all week, so don’t be surprised when they come out and play well. Missouri will have to show another gear I haven’t seen from them yet to keep the Gamecocks from covering. I don’t see that happening.